If you mosey over to my Facebook page and "like" the most recent dress in the 50 Shades of Pink, I'll put you in a drawing for one of he advance copies of NO WAY TO KILL A LADY. Here's dress #36, by Valentino. Great, right? 50 Shades of . . . PINK! Pink is Nora Blackbird's favorite color! Nora Blackbird wears vintage couture dresses from the collection Grandmama Blackbird left behind in the attics of Blackbird Farm. Here is Nora's favorite---it works for any occasion but a funeral. It's Valentino, of course, from the 1980s. What do you think? 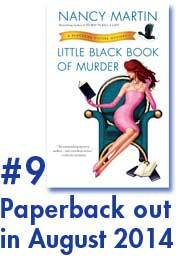 You can pre-order your copy of the 8th---and new!--Blackbird Sisters mystery now from your favorite bookseller. Get the best price by ordering early. Nora Blackbird is going to a rooftop gala on Saturday night. What should she wear? Either way, it's Oscar de la Renta. But....black or white? Come join us on Nancy's Pinterest page to help make solve these haute couture dilemmas. Have you imagined Blackbird Farm the same way I have? 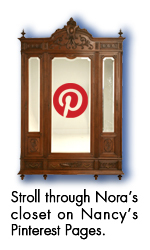 Check out my Pinterest page for some images that best represent what I had in mind when I created Nora Blackbird's home. The first review for NO WAY TO KILL A LADY is out! Here's what Publisher's Weekly has to say about the book (which is due in stores August, 2012). Click here. If you read the Blackbird Sisters Mysteries, you know Nora spends most of her evenings out on the town--attending all kinds of social events. On Fridays, she tends to show up at elegant, black tie occasions. What's a down-on-her-luck girl supposed to wear on nights like this? She raids her grandmama's collection of vintage couture, of course. Here's one of her not-so-casual Friday evening outfits. This one, Galliano. Do you own a Nook? Nook readers, you can have MICK ABRUZZO'S STORY with a couple of clicks. Read how Michael first met Nora Blackbird by clicking here.